Associação Chapecoense de Futebol (Chapecoense Football Association) was founded on May 10, 1973, and it is currently the largest, most successful and well-structured professional football team in the western region of Santa Catarina. Its origin is linked to the fact that, in the 1970s, the region only had a few amateur teams, which were insignificant in relation to professional football. With the purpose of reversing this situation, some of the city´s sportsmen, young people passionate about the sport, decided to get together to create a professional football team. Among those present at the first meetings were Alvadir Pelisser, Heitor Pasqualotto and Altair Zanella, representatives of Clube Independente, and Lotário Immich and Vicente Delai, representatives of Clube Atlético de Chapecó. In general, it can be said that Associação Chapecoense, eventually one of the biggest football names in Santa Catarina, arose from the combination of the Atlético Chapecó and Independente clubs. From the outset, the idea pleased both the population and the local leaders. Another remarkable fact from our history, which can be stated as one of the reasons for the success of the club, is the fact that, since its foundation, the association has always counted on the support of businesspeople from the city and surrounding region. The first set of shirts, for example, was donated by Ernesto de Marco, a businessman and the owner of Casas Vitória, a fact that was remembered by Pelisser, in a testimony given to the club’s 30th anniversary commemorative booklet of, edited by the Association itself, as being a true honor for the team. Over the years, Chapecoense has received major incentive from other remarkable people in the history of Chapecó, among which include the following: Heitor Pasqualoto, Avelino Biondo, Moacir Fredo, Arthur Badalotti, Gentil Galli and Plínio Arlindo De Nês, an entrepreneurial leader and politician who gave unconditional support to the club. In 1973, the first board of Associação Chapecoense de Futebol was formed, constituted by the leaders: President: Lotário Immich; Vice-President: Gomercindo L. Putti; Secretary: Jair Antunes de Silva; 2nd Secretary: Altair Zanela; Treasurer: Alvadir Pelisser; 2nd Treasurer: Paulo Spagnolo; Sporting Director: Vicente Delai; as well as counting on the participation of Jorge Ribeiro (Lili) and Moacir Fredo. As recalled by Pelisser “many did not receive anything, they played wearing their hearts on their sleeves; they went to the field with desire and determination, even though the revenue of Chapecoense was small”. 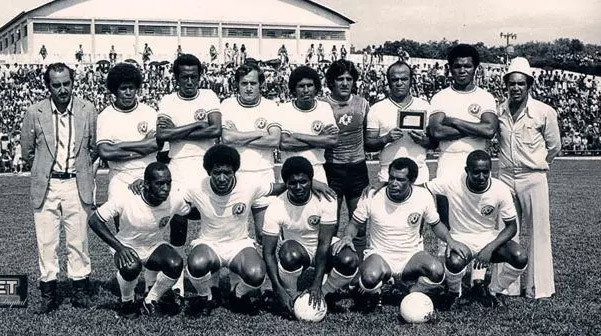 The first formation of the team was composed by Odair Martinelli - Alemão (SAIC’s driver), Zeca (nicknamed “Calceteiro” because he was responsible for the installation of the sidewalks, employee of the City Hall of Chapecó), Miguel (Corporal of the Military Police/SC), Boca, Vilmar Grando, Caibi (Celso Ferronato), Pacassa (José Maria), Orlandinho, Tarzan, Ubirajara (Military Police/SC), Beiço, Airton, Agenor, Plínio (from Seara), Jair, Raul, Xaxim and Casquinha (a BESC employee). All of them were accompanied by Nilson Ducatti and by the leaders. “It was against São José de Porto Alegre, on the field of Colégio São Francisco, Chapecoense 1-0 São José. The second match was played in the city of Xaxim, against Novo Hamburgo”. 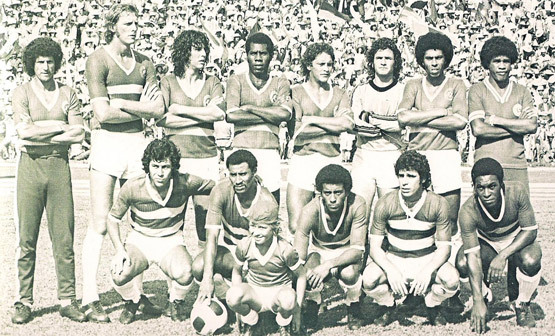 Still in 1973, Chapecoense went to Florianópolis to play against Avaí, and the game ended in a 2-2 draw. “Drawing with Avaí in the capital was the greatest glory for Chapecoense,” said Pelisser. Today, Chapecoense has the support of businesspeople, leaders, athletes and former athletes, club members and the local press. This is a merit of years of history and titles won. In total we have six Campeonatos Catarinense titles, in the years of 1977, 1996, 2007, 2011, 2016 and 2017. In 2006, the team was Champion of the Santa Catarina Cup. In 2009, on competing in the Copa do Brasil (Brazil Cup), Chapecoense had access to division D of the Brazilian Football Championship. With qualification from Série D, the fourth level of the Brazilian Football Championship , also in 2009, the team was promoted to Série C, the third level of the Brazilian Football Championship, and the division that it began competing in from 2010. The 2011 title also qualified Associação Chapecoense de Futebol to compete in the Copa do Brasil, the second biggest tournament in Brazilian football which, also, gives the champion the right to compete in Libertadores da América Cup, the most important football tournament in Latin America. All of these factors led the board of the club to use all possible means to build competitive teams. This, however, was only possible from the intense and wide-scale participation of the local supporters, attending the games or contributing permanently to the club. The year 2012 marked an excellent season for Verdão (Chapecoense). Qualifying for the semifinal of Série C, the team, managed by the coach Gilmar Dal Pozzo, won the right to compete in Série B in 2013, the second division of the Brazilian Football Championship. This was an unprecedented fact in the history of Chapecoense, which surprised many people. In this period, the club also achieved its greatest feat: the rise to the elite of Brazilian football, in exactly the year of the World Cup in the country. With a main objective of gaining experience and keeping the club in the elite division, the team arrived at the end of 2014 achieving its goal. The arrival of 2015 was truly full of enthusiasm. With the experience acquired in 2014, the board worked on assembling the team with a principle: assemble a team to face the entire season, with a main focus on the Brasileirão (The Brazilian Championship). In spite of Chapecoense not reaching the state championship final, the third placed finish secured a spot in the Copa do Brasil for the third consecutive year. Even without going on in the national competition, Chapecoense has entered in an unprecedented challenge: Sudamericana Cup. In the first phase - in which matches are among Brazilian teams - Verdão defeated Ponte Preta, what gave the team the access to 1/8 eliminations, against Libertad. Front the Paraguayan team, a draw in the first match and the same result in the second one, was what lead the approach to the penalty shootout and ended in a green and white victory. In quarter-finals - which were responsible for a part in Chapecoense history for being the only time that has advanced to this competition step - a respectful and traditional opponent: River Plate. And Chape, as well, has surprised. In spite elimination, they left head held high after a victory for 2x1 against River, of such a great legacy in South American competition. It was an insufficient result to advance to the semifinals, but with a great importance in order to perpetuate the first team participation in an international competition. Following the same histories written in the previous year, 2016, the new one has started in an inspiring way. After accomplishing the State Championship in an undefeated way, Chapecoense has achieved the final against Joinville. In the first match, northern, Verdão has won for 1 to 0. In the second match, at Arena Condá, under a torrential rain, Chape left behind the scoreboard but fought for the tie and finished conquesting the fifth star. The great start was the most striking foreboding of Club´s history. In August, Verdão started their walking to the second participation at Sudamericana. In the first match, they passed, with great strain, for Cuiabá. Ahead, in the 1/8 eliminations, no one else than the “Rei de Copas” - Independiente´s team, from Argentina. In the first match, a draw with no goal, and in the second match, at the crowded Arena Condá, an exciting dispute in the draws, that stamped Verdão passport to the quarter-finals. The opponent was Junior Barranquilla, from Colombia. In the first match, defeat alviverde by the minimum score. In the second match, goal rain: victory for 3 to 0 and the warranty in the semifinals. Two matches to the great final, the opponent San Lorenzo. In the first match, draw in one-to-one in the Argentinian team mastery. In the second match, heroic performances, epic defenses and the vacancy in the final conquered with all race - and the difficulty - that has always identified Chapecoense. It was impossible to disguise the expectation about the grand finale. Club, fans, all Chapecó city and the whole region were mobilized for what would be the apex of the entire Chape existence. More than that, Chape, with their eminent charisma, was Brazil in South America and has carried with them a legion of fans, sympathizers and lovers. But in that night, November 29th, however, when the delegation traveled to Colombia for the great final first match - which would be played against Atletico Nacional de Medellin - a tragedy interrupted the dream. The plane carrying the team, the coaching staff, the leaders, journalists and guests crashed into a hill and fell, killing 71 passengers. The accident impact was and still remains immeasurable. We will remember, forever, our eternal heroes, in and out off the field. The history must continue, mainly to maintain the legacy of those who, with great passion and dedication, led Chapecoense to the South American soccer apex. 2017 has started with a guiding and key word: reconstruction. With a team assembled in record time, Chapecoense won - with just over four working months - the unpublished Bi-championship. Besides that, the team played Recopa Sudamericana final, debuted Libertadores, they carved out, for the first time, Brasileirão´s leadership and still continues working hard to ensure the best possible performance in all the competitions that fill the team calendar. With all the city support and an entire passionate region, Verdão continues to surprise, being the unbelievable team and making history, in everything that is proposed.